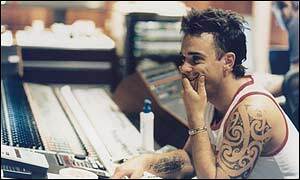 Singer Robbie Williams has said he believes music piracy is a "great" idea. He made the comment at a music trade fair in Cannes, predicting it would anger his record company EMI. Williams said he had investigated the issue of music piracy before renegotiating his new recording contract last year. He said: "I think it's great, really I do. "There is nothing anyone can do about it. "I am sure my record label would hate me saying it, and my manager and my accountants." The record industry estimates that it loses millions of pounds each year thanks to the public downloading tracks free from the internet. Williams, whose contract with EMI is worth a reported £80m, said when he had been to see all the major labels and asked what they were going to do about music piracy "I heard a lot of hot air". "The heads of the record labels don't know what to do about it." Williams' latest best-selling album Escapology has so far sold five million copies since it was released on 18 November. EMI has said it will make a profit once a total of 18 million albums have been sold from its six-album deal with Williams. Currently, record companies fear some 800 million bootlegged records are sold annually, compared with the industry's total legitimate sales of 2.4 billion discs in 2001. This is coupled with the music industry facing the problem of tracks being downloaded free of charge from the internet. Total sales for the music industry fell by 9% last year to $30.3bn. Last month the British Phonographic Industry (BPI) said the circulation of pirated music in the UK had risen by more than 36%. The figures, based on the number of seizures in 2001, represent £27m worth of music according to the music industry watchdog. Is Robbie Williams worth it?